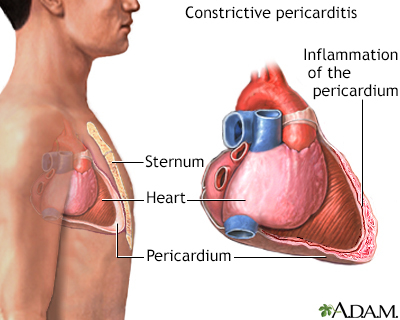 Constrictive pericarditis is a disorder caused by inflammation of the pericardium, the sac-like covering of the heart. Eventual thickening, scarring and contracture of the pericardium occurs causing it to be less elastic. 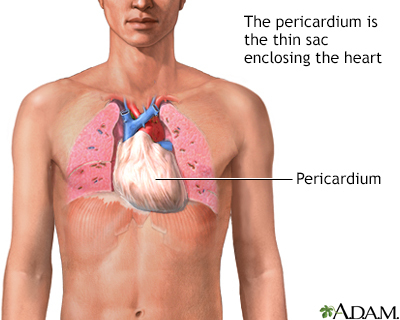 This prevents the pericardium from stretching and results in reduced filling of the chambers of the heart. This reduces the amount of blood pumped by the heart and causes blood to back up behind the heart, resulting in symptoms of heart failure. Constrictive pericarditis may be life threatening if untreated.